I still don’t think anything of soy products. They make my teeth want to vomit. powerful position with a legendary expense account. to rub people up the wrong way. of James Bond, but I suppose that food writers’ minds move in mysterious ways. placing them on an equal footing with the grand old temples of French gastronomy. first time that Hesser fiddles with it, she will attract huge amounts of attention. small private room just off the kitchen that regular customers can book". to a much broader cross-section of the national population. into something of a spectator sport, helped on their way by novelist Will Self. and is certainly unlikely to appear in the New York Times any time soon. review is more than a list of dishes with a star-rating at the end. read much more like magazine pieces than like old-fashioned reported stories. And what Hesser is doing in this review is definitely close to magazine journalism. with carefully rumpled hair wearing a "Late Night With David Letterman"
diners’ names" instead. Third person, past tense, objective, reported. reviews which always referred to oysters as "bivalves" on second mention. scene, rather than an objective, just-the-facts-ma’am report. scene is at least as important as the quality of the food. ingredients – here’s one passage, verbatim. a relish of peanut and cucumber cut into minuscule cubes. lined up". Nobody does any of this: it just magically happens. Eleven year-olds are taught that "the dish is eaten with a spoon"
one of them) can get away with that sort of thing. In it, he talks about how he wanted to "strip away the New York parochialism"
by that kind of brutal managerial shorthand. punch with a lead story on the rock group White Stripes." and tell me if you can ever imagine a male walking out of a bookstore with it. the world of best-sellerdom could help punch up the food section somewhat. was a hit. Then followed Otto, Ilo, Tappo, Beppe, Gonzo, Pazo, Pico and Crispo. complete without it? — Therapy. and tell Hesser that she should start bringing more of herself to her reviews. these things in their own lives and feel strongly about them." three restaurants a night. It’s kind of grueling and unpleasant. You get jaded. about food. I knew that I didn’t want to become a restaurant reviewer. Nice, Felix. Hesser, though, is just on the review beat until they name a permanent replacement for Grimes. In February, they said the announcement would be made in “late winter.” So we may not have her to kick around much longer. yeah, lock’s point kind of makes the preceding blowharding even more useless than the normal crap posted in this blog. some people like just like to hear their own electronic text too much. this is a great read. well done. Do you mean tofu? When you say “I don’t think anything” do you mean that you have no opinion? or that you do not like them? Have people not read the work Ruth Reichl, the pre-William Grimes food critic? Both while at the Times and afterward? Ruth wielded an iron ladle and did rule the NY restaurant world. While Amanda might be on some odder flights of fancy, it really doesn’t seem that bad. She wrote this . While I’m the first to make fun of anyone so cute and tiny, I think she’s great – in person, she’s humble and interesting and genuinesly passionate about food. See the Editor’s Note in today’s NYT about the Hesser review in question. Guess what? The chef she praised wrote an effusive blurb for her book. The editorial comparison between a theater critic as ” dominating national voice in any area of cultural coverage” and a food critic seems odd. People don’t just go to NY for Broadway and dinner, but shows go on the road. And get turned into movies. A theater critic, even one writing about local productions, has a kind of *possible* application to my-life-outside-NYC that a restaurant reviewer can’t have, except by setting a national tone for restaurant reviewers (the UK effect you point out). A side note on your Raines digression — since when is working for a journalist “clerking”? Isn’t that what young lawyers do for judges? Puh-lease! I may actually buy the issue of the Atlantic so I can throw it across the room occasionally while I read; that’s hell on laptops. Amanda Hesser is marvelous. I can’t believe all these bitter, sour would-bes that are so critical of her. She has a style and voice of her own and I look forward with pleasure to every thing she writes. Amanda Hesser is marvelous. I can’t believe all these bitter, sour would-bes that are so critical of her. She has a style and voice of her own and I look forward with pleasure to every thing she writes. Obviously, the NYTimes understands and values this treasure they have found! I am sorry to disagree. I just finished reading Amanda’s book and I thought it was wonderful. I loved the recipes and I loved the way she savored her friends and family. I loved the way she saw the good in all the people in her life. Her cooking style is not exactly mine but everyone is different. The people who are negitive and hurt others for no reason are the people who make this world a sad place. 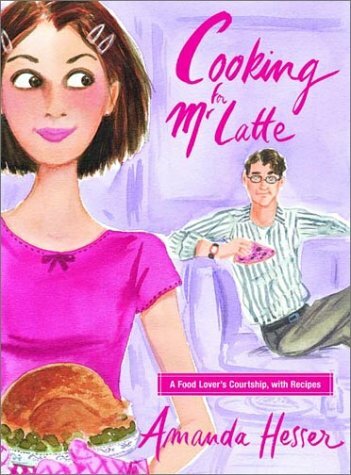 I thank Amanda for a book that renewed my passion for cooking and enjoying the people in my life!